Puukkojunkkari (or häjy, Swedish: knivjunkare, translated to English as knife-fighter) was a term used of troublemakers who were active in the Southern Ostrobothnia region of Finland in the 19th century. Fights among puukkojunkkaris were common, and often resulted in homicide; one could even get stabbed at a funeral. Puukkojunkkaris usually made trouble at weddings, stole horses and circulated among towns and villages. They also participated in gambling, thievery and courtship with women. The most notorious puukkojunkkaris lived in towns near the Lapuanjoki river, such as Alahärmä. 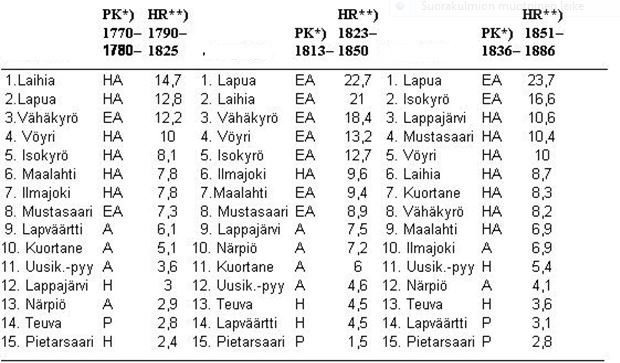 The first homicides happened in the 1790s, but the famous ”golden age” of puukkojunkkaris lasted from the 1820s to the 1880s. Puukkojunkkaris were present in all society classes. They included both free houseowners and farm servants. The houseowners were often gang leaders. Puukkojunkkaris were often feared and respected, and fought for their honour. The code of honour disallowed fear and respected fighting. Puukkojunkkaris were often difficult to prosecute because few people dared testify against them. Puukkojunkkaris also received admiration and respect because they dared to stand up against society and authorities. Many attempts have been made to explain the rise of puukkojunkkaris. In the 19th century, the living standard in Ostrobothnia rose, and because of this, weddings became grandiose events with lots of alcoholic beverages. Young men in Ostrobothnia did not often get a chance to inherit their own farm in their home town and earn their own wealth, which led to frustration. Reino Kallio’s theory of knife-fighters (puukkojunkkarit) is based on the idea of a counter reaction caused by social control that has been taken too far. He sees youth’s violent behaviour as a protest-like rebellion against the pressure exercised by the power structure; particularly against local laws and parish discipline (pitäjäkuri). The resistance that started as little more than slight mischief became branded as troublemakers (häjyt) and led to a path towards serious crimes. This was particularly due to the fact that parish discipline, which was stricter than general law, lowered the threshold of crime. At the time, there were many new ways of youngsters spending their free time, such as wandering around outdoors at night, which was considered a breach against the curfew and a threat to the existence of class society. Therefore, district courts started punishing people for curfew at night – as well as for other breakages against parish discipline. The fundamentalist church and religious revivalist movements in the 18th and 19th centuries, such as pietism, also had a negative view towards young people’s leisure activities due to moral reasons. This led to competition between different religious groups, first leading to tighter church discipline (kirkkokuri) and then to parish discipline (pitäjäkuri). The situation was brought to a head by the labour shortage due to tar and peatland burning cultivation that brought more tension to the working conditions, while the rich, house-owning population competed with each other, building baronial, 1.5 to 2 storeys high residential buildings. By invoking general regulations, masters could avoid disciplinary conflicts with their children or hirelings when there was labour shortage. Furthermore, increased drinking caused both problems to families and conflicts inside communities. The disciplinary regulations that were normally confirmed by the governor limited and regulated in detail the already scarce free time that youngsters had: in addition to curfew at night dances, the publication of the banns of marriage and weddings, gatecrashing, moving, gathering, the use of spirits, cardplaying as well as general noisemaking and loitering. Because the young age groups usually took care of the heaviest physical work, conditional fines were introduced in the 19th century to prevent days off. In Lapua, Laihia and Mustasaari, not only hirelings, but also house-owners and crofters were banned from having free days. At worst, parish discipline even led to group criminalisation of young people, as was the case in Kauhava and Vähäkyrö in the 1770s and 1780s, in Vöyri in the 1820s and 1830s, and in the greater parishes of Laihia and Lapua a couple of decades later. Parish discipline was implemented as group punishments, and they were only taken to court in certain parishes in southern Ostrobothnia, not elsewhere in Finland – except for a few possible exceptions. All in all, troublemaking was based on the background of a long-term crisis caused by a radical socio-economic change, which triggered youth violence due to the parish discipline managed and maintained by authorities. Finally, the emerged culture of violence also started feeding itself. * P = normal discipline, H = a little more severy discipline than normal, A = severy disciplin, HA = very severy disciplin, EA = exceptionally severy discipline. ** capital crimes per 100 000 inhabitants. The model that Mr. Kallio used for the first time in his thesis in 1982 has also been called the youth rebellion theory. Its main sources include court minutes and document material from local archives. The theory approaches the stigmatisation theory that the internationally known sociologist, Mr. Anthony Giddens, considers to be one of the most important criminal theories. According to this theory, criminal behaviour is not a characteristic of an individual or a group, but rather an interactive process between criminals and non-criminals. The theory is based on the concept that no deed is criminal in itself, but the definition of crime constitutes a part of the exercise of power. An individual stigmatised as criminal is discriminated by authorities, which supports criminal behaviour and displacement from the mainstream population. A similar view can indirectly also be seen in the drama Pohjalaisia (Ostrobothnians) that was published by Mr. Artturi Järviluoma but mainly written by Mr. Anton Kangas from Alahärmä. In the central parishes of both Finnish and Swedish-speaking southern Ostrobothnia, those who defended parish laws and regulations particularly directed their aims for power towards young working population, such as house-owners’, crofters’ and independent workers’ children, as well as soldiers and servants, who were in a socially subordinate position. Hundreds of them were fined for violations against parish discipline during the last three decades under the Swedish reign, so it was at the same time the first large-scale youth problem in the Finnish society that we know of. On the local level, order was maintained by masters and, as trustees, mainly village aldermen (oltermannit) and lay members (lautamiehet) of the courts, whose duty was to inform authorities of any violations against rules. Aldermen were sometimes even fined for neglecting their order maintaining duties. Many rural police chiefs (nimismiehet) also aimed at catching those guilty of violations against general order, and taking them to court. In the worst cases of public disorder, rural police chiefs had to call Russian armed forces, i.e. Cossacks, for help – one of them was even killed at a wedding in Lapua in 1862. Maintenance of order, and repetitive criminalisation after that, led to their displacement from the community. As a result, some of them considered themselves criminals, acted accordingly and even boasted of their criminal “heroic deeds”, which were sometimes also directed at rural police chiefs, priests and trustees. Santeri Alkio describes disturbances aimed at the last-mentioned group in his novel Puukkojunkkarit (Knife-fighters). Yllä olevan tekstin kolme ensimmäistä kappaletta ovat englanninkielisestä Wikipediasta. Senjälkeisen tekstin on kääntänyt Kaija Dahlström Reino Kallion kirjoittamasta ja alla olevasta suomenkielisestä tekstistä. Reino Kallion puukkojunkkariteoria perustuu ajatukselle liian pitkälle viedyn sosiaalisen kontrollin synnyttämästä vastareaktiosta. Hän näkee nuorison väkivaltakäyttäytymisen protestiluontoisena kapinana valtakoneiston painostusta, erityisesti paikallislakeja ja pitäjäkuria vastaan. Lievistä ilkitöistä alkanut vastarinta johti häjyiksi leimaamiseen ja kierteeseen kohti vakavia rikoksia. Näin tapahtui varsinkin siksi, että yleistä lakia tiukempi pitäjäkuri alensi rikoskynnystä merkittävästi. Tällöin monia nuorten uusia vapaa-ajan viettotapoja kuten yöjuoksua, joka tulkittiin öisen ulkonaliikkumiskiellon rikkomiseksi, alettiin pitää uhkana sääty-yhteiskunnan olemassaololle. Siksi yöstelystä – kuten muistakin pitäjäkuririkkomuksista – ryhdyttiin rankaisemaan käräjillä. Puhdasoppinen kirkko sekä 1700- ja 1800-luvun uskonnolliset herätysliikkeet, muun muassa herännäisyys, suhtautuivat moraalisistakin syistä kielteisesti nuorten vapaa-ajan harrastuksiin. Seurauksena oli eri uskonsuuntien välistä kilpailua, joka johti ensin kirkkokurin koventumiseen ja sitten pitäjäkuriin. Asiantilaa kärjisti lisäksi tervan– ja kydönpolton synnyttämä työvoimapula, joka kiristi työoloja samaan aikaan, jolloin vauras talollisväestö kilpaili keskenään rakennuttamalla komeita puolitoista- tai kaksifooninkisia asuintaloja. Vetoamalla yhteisiin järjestyssääntöihin isäntien ei tarvinnut erikseen työvoimapulan vallitessa kiistellä kurinpidosta lastensa tai palkollistensa kanssa. Lisäksi lisääntynyt juopottelu aiheutti ongelmia paitsi perheille myös ristiriitoja yhteisöjen sisälle. Tavallisesti maaherralla vahvistetut kurisäädökset rajoittivat tai säännöstelivät yksityiskohtaisesti nuorten muutenkin vähäistä vapaa-aikaa: yöjuoksun lisäksi tanssien, kuuliaisten ja häiden viettoa, kuokkavierailua, liikkumista, kokoontumista, viinan käyttöä, kortinpeluuta sekä yleistä metelöimistä ja joutilaisuutta. Koska nuoret ikäluokat tekivät yleensä raskaimmat ruumiilliset työt, ryhdyttiin siksi 1800-luvulla estämään uhkasakoin vapaapäiviäkin. Lapualla, Laihialla ja Mustasaaressa niiden pitäminen kiellettiin palkollisten lisäksi myös talollis- ja torppariväestöltä. Äärimmillään pitäjäkuri johti jopa nuorten joukkokriminalisointeihin, kuten tapahtui Kauhavalla ja Vähässäkyrössä 1770- ja 1780-luvulla, Vöyrillä 1820- ja 1830-luvulla sekä Laihian ja Lapuan suurpitäjissä parikymmentä vuotta myöhemmin. Pitäjäkuria toteutettiin joukkorangaistuksin ja käräjille saakka vietynä ainoastaan tietyissä Etelä-Pohjanmaan rintapitäjissä, ei – mahdollisia yksittäisiä poikkeustapauksia lukuun ottamatta – muualla Suomessa. Kokonaisuudessaan häjyilyn taustalla oli yhteiskunnallis-taloudellisen murroksen aikaansaama pitkäaikainen kriisi, jonka viranomaisten johtama ja ylläpitämä pitäjäkuri laukaisi nuorisoväkivallaksi. Näin syntynyt väkivaltakulttuuri alkoi lopulta ruokkia myös itse itseään. Kallion ensi kerran väitöskirjassaan 1982 esittämää mallia on kutsuttu myös nuorisokapinateoriaksi. Sen päälähteitä ovat käräjäpöytäkirjat sekä paikallisarkistojen asiakirja-aineistot. Teoria lähenee kansainvälisesti tunnetun sosiologin Anthony Giddensin yhtenä tärkeimmistä rikollisteorioista pitämää leimautumisteoriaa, joka ei pidä rikollista käyttäytymistä yksilöiden tai ryhmien ominaisuuksina, vaan vuorovaikutusprosessina rikollisten ja ei-rikollisten välillä. Teoria lähtee käsityksestä, että mikään teko ei ole itsessään rikollinen, vaan rikollisuuden määrittelyt ovat osa vallankäyttöä. Rikolliseksi leimattu yksilö joutuu auktoriteettien syrjimäksi, mikä edistää rikollista käyttäytymistä ja syrjäytymistä valtaväestöstä. Tällainen näkemys tulee välillisesti esille myös Artturi Järviluoman julkaisemassa, mutta alahärmäläisen Anton Kankaan pääosin kirjoittamassa näytelmässä Pohjalaisia. Sekä suomen- että ruotsinkielisen Etelä-Pohjanmaan rintapitäjissä pitäjänlakeja ja järjestyssääntöjä puolustaneet kohdistivat valtapyrkimyksensä erityisesti nuoreen työtä tekevään väestönosaan kuten talollisten, torppareiden tai itsellisten lapsiin sekä sotilaisiin ja palvelusväkeen, jotka olivat yhteiskunnallisesti alisteisessa asemassa. Heitä sakotettiin kihlakunnanoikeuksissa pitäjäkurin rikkomisesta Ruotsinvallan kolmena viimeisenä vuosikymmenenä satamäärin, joten kyseessä oli samalla tiettävästi ensimmäinen laajamittainen yhteiskunnallinen nuoriso-ongelma Suomessa. Paikallistasolla järjestyksen ylläpitäjiä olivat talojen isännät sekä luottamusmiehistä lähinnä oltermannit ja kihlakunnanoikeuksien lautamiehet, joiden velvollisuutena oli ilmiantaa viranomaisille sääntöjä rikkoneet. Oltermanneja toisinaan jopa sakotettiin järjestystehtävien laiminlyömisestä. Järjestyshäiriöihin syyllistyneitä pyrkivät myös monet nimismiehet ottamaan kiinni ja saattamaan heidät tuomittaviksi. Pahimpiin järjestyshäiriöihin nimismiehet joutuivat kutsumaan avuksi venäläistä sotaväkeä eli kasakoita – heistä yksi jopa surmattiin häissä Lapualla 1862. Nuoriin kohdistunut järjestyksenpito ja sitä seurannut toistuva kriminalisointi johtivat heidän syrjäytymiseensä yhteisöstä. Tällöin osa heistä näki itsekin itsensä rikollisena, toimi sen mukaan ja jopa kerskaili rikollisilla ”uroteoillaan”, joiden kohteiksi joutuivat toisinaan myös nimismiehet, papit ja luottamusmiehet. Viimeksi mainittuihin kohdistunutta häiriköintiä kuvaa Santeri Alkio Puukkojunkkarit-romaanissaan. Lähde: Tekstit osasta Wikipedian hakusanaa Puukkojunkkarit (15.8.2015).